McKinsey, BCG, Bain type of Corporate Business Presentations are our specialisation. 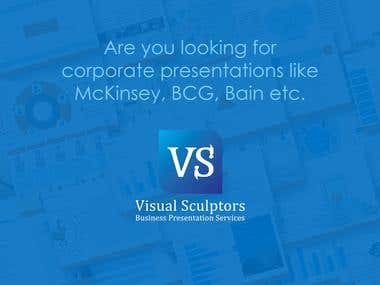 Visual Sculptors is a team of Business Presentation Experts having 9+ years of McKinsey experience. Our Values: 1. Attractive presentations with exceptional quality 2. On-time delivery and transparent communication 3. Affordable and flexible costs 4. Assuring confidentiality of the work Our Services: 1. Producing complex slides from scratch delivering exceptional output with meticulous proof-reading of the contents 2. Categorising the raw data into suitable graphs using MS-Graph, and Think-cell software 3. Customising/creating PowerPoint Templates and converting slides from one template to the other as per client specifications (colours, fonts, design) 4. Identifying and fixing all inconsistency in existing PowerPoint slides 5. Enhancing existing presentation using conceptual frameworks, effective pictures, icons, flags etc.